Yesterday, I was honored to deliver the annual State of the City Address hosted by the Malden Chamber of Commerce. At the beginning of the presentation, which will be shown on our YouTube channel sometime next week, I officially handed the keys to the City Hall building at 200 Pleasant Street to Sandi Silk of Jefferson Apartment Group, the new owners of the building. I continue to be grateful to our Legislative Delegation, City Council, Strategic Planning Analyst Ron Hogan, and Malden Redevelopment Authority Executive Director Deborah Burke for their tireless efforts in making this vision a reality. 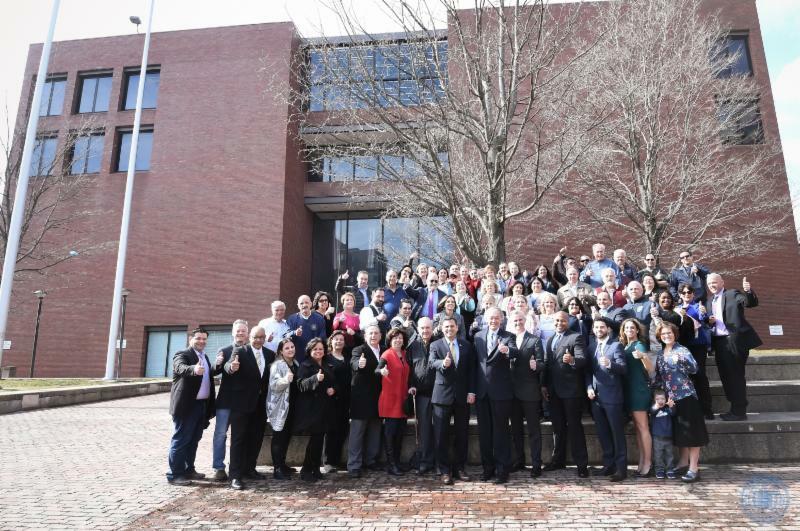 Last Friday, I was joined by United States Senator Edward Markey, former Mayors Richard Howard and Jim Conway, members of our Legislative Delegation, the City Council, School Committee and City employees for one last photo in front of City Hall at 200 Pleasant Street. We have finally closed in on our longstanding goal to reconnect Pleasant Street as the main gateway to the heart of our downtown. In the next month the entire three-acre site will be fenced off and demolition will commence. Stay tuned - Malden is certainly a City on the Move!